Dr. Adam De Eyto from the University of Limerick interviewed Frank Long, Director at Frontend.com, Europe’s leading User Experience design agency for Iterations magazine,. In the article ‘The Growth of an International UX Consultancy in the Changing World of Design’ Frank reflects on the changing nature of design and on how Frontend.com has become nationally and internationally recognised for its work in UX, user research, and interaction design. What is the history of Frontend.com and their design activities in Ireland and internationally? Frontend.com was founded in Dublin in 1998 by a core group of industrial designers. At that time the Internet was pretty new and in many ways poorly understood. Back then, companies were content with recreating versions of their printed brochures online, and there were plenty of digital agencies doing this kind of work. Very little consideration was given to what users wanted to do, or how the online environment could be used more effectively. At Frontend.com, there was recognition of the potential for the Internet to do a lot more, to deliver services and functionality directly to users. But for these services to be effective, they would need to be designed in a way that was easy for users to understand and easy for them to use. So Frontend.com was set-up as a different type of design agency. Our focus was on User Experience. We placed a heavy emphasis on user research, task-flow and designing better interactions. We wanted to involve the end user in our design process so we started testing our solutions with them to understand how it could be improved. UX design was a far more difficult concept to sell back then, and we had a lot of explaining to do. Not everyone understood our way of working but gradually the concept began to take hold. 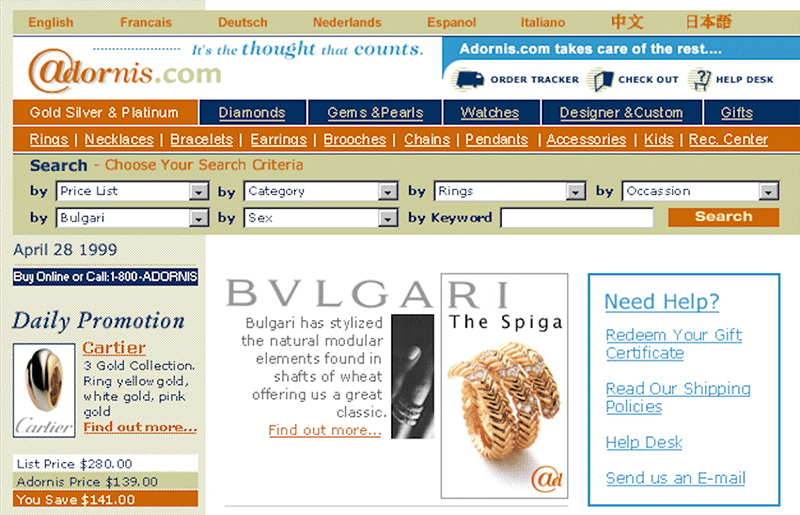 Archival web design of Adornis.com from 1999. Can you speak about how Frontend.com developed as a small start-up and then into a leading award-winning design studio with an international client base? Well, it’s been a bit of a rollercoaster ride really. The studio grew very rapidly in the first two years. 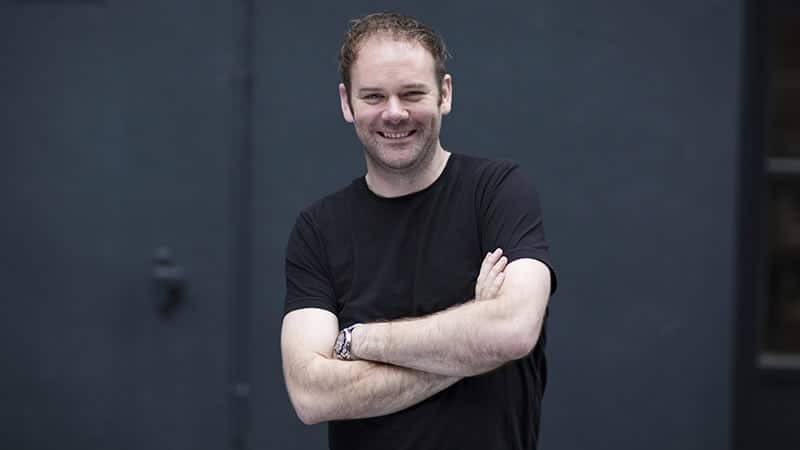 Not only were we the first UX agency in Ireland, but one of the first in Europe – as the business potential of the web started to grow, the work began to roll in. In 1999 we designed the first business Internet banking interface for Barclays Bank in the UK. Around the same time, we began work on the first interactive digital TV platform for UPC in the Netherlands. We beat off stiff competition to win a major contract with HP in Barcelona, providing UX for their inkjet printer division. Then Reuters, BBC, and GSM quickly followed. It seemed like we could do no wrong. 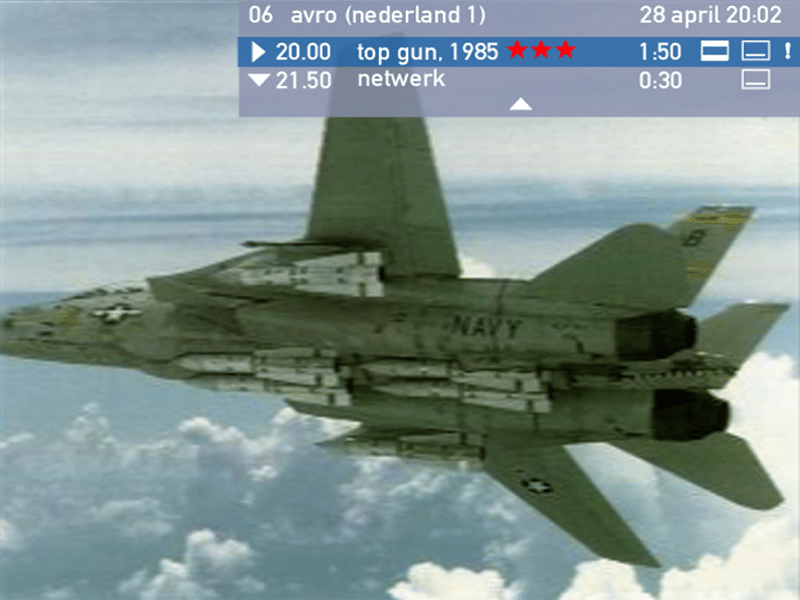 Archival interface design for UPC digital TV from 2000. Before we knew it we had around 35 staff in the studio. Everything was booming, and then in September 2001, it all went bang! The dotcom bubble burst. Our sales dropped by 80% in one month – suddenly it became a struggle to survive. All around us, clients folded and invoices went unpaid. Lots of design agencies closed, others, ourselves included were forced to downsize dramatically. Nothing we had experienced before prepared us what was happening around us. It was touch and go for the next few years. We were scrambling day-to-day to keep the business alive while at the same time trying to figure out a more strategic solution. The initial temptation was to broaden our focus, increasing the volume of work coming through – but we felt that would dilute our brand. The alternative was to increase the value of our work. To do this we needed to become even more specialised. We chose the latter route, carefully selecting the work we took on, focusing on strategically important industries such as finance, software, and healthcare, while at the same time turning down a lot of more tactical web work. By honing our expertise in these fields, we were able to compete with the bigger international competitors. As the UX design field gradually recovered we were well placed to capitalise and today our business has a predominantly international focus. At last count we had client work in 20 countries spanning the USA, Europe, and Asia. 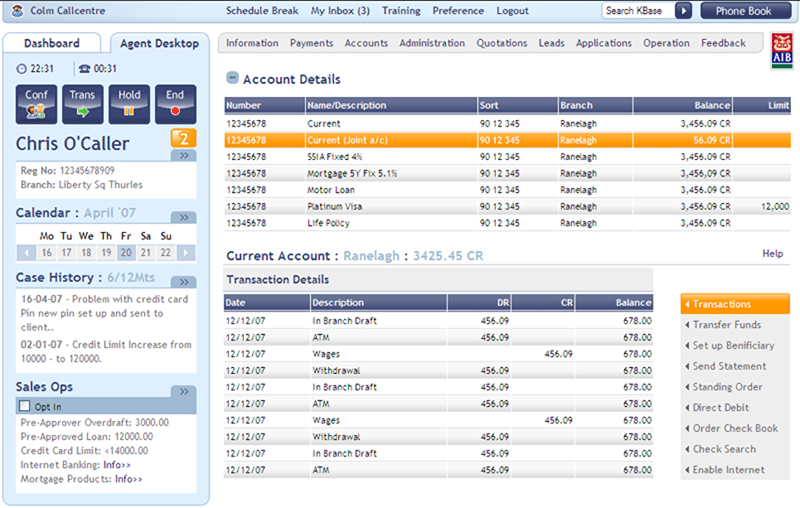 Archival application design of AIB Call Centre dashboard from 2007. Does Frontend.com have a core design philosophy and how is it expressed? Well, obviously the user-centred design philosophy is central to everything we do. We tackle problems from a user perspective and validate solutions with real users along the way. However, due to the nature of our work, which is often more business orientated, we need to place an emphasis on the more technical interface requirements as well. I think we strive harder than most to create solutions that optimise commercial performance as well as delivering good UX. Research is a huge part of that design philosophy – you can only innovate from a position of complete understanding. It can be difficult as a consultancy to secure budgets for research, however, awareness among clients of the importance of research in UX projects has grown massively in the last few years. It would not be unusual for us now to allocate 50% of individual project costs to user research. From an aesthetic perspective, we have a minimalist approach, good design is often invisible. This is especially true of interaction design. It is not about how the interface looks, but the more about how it flows and how it adapts over time to the user’s evolving needs. Good design is a formative element of the user experience and it should mature and adapt over time. This is the ultimate UX design goal. How does the Frontend.com brand position itself in the emergent and established worlds of User Experience, User Interface and Product Service Systems? The traditional fields of industrial design, graphic design, web and advertising even, are all being disrupted by the evolving technology landscape. UX straddles all of these disciplines; as a UX designer, I see it all as one converging solution space. When you think about it, UX really describes the entire customer journey. Increasingly we are working on projects that encompass complete user ecosystems such as packaging, product, instructions, training, apps, service delivery, and so on. We can’t be experts in every discipline, so design teams need to be more collaborative now. We regularly partner with industrial design, branding, web agencies etc, to deliver a consistent UX across all components. While each artefact in itself needs to be designed – a good UX strategy will address of all elements and act as a type of glue that binds it all together – delivering the most appropriate experience to the end user. UX straddles all of these disciplines. As a UX designer, I see it all as one converging solution space. What benefits are there if any to having Frontend.com based here in Ireland? I’ve given a bit of thought to this over the years and my perspective has evolved over that time. It might be easier to focus on the drawbacks rather than the benefits. 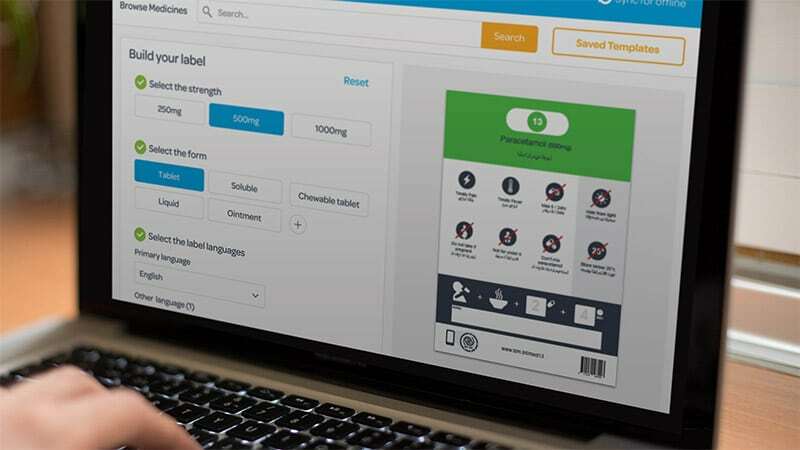 The UX field in Ireland has grown considerably in recent years, and Ireland does have a strong indigenous software industry, with a growing number of Irish companies becoming global players in their own right. Yet the fact remains, that Ireland is a relatively small market and there have been times when this has had a limiting effect on business growth and sustainability. So in that respect, it would be easier to be located somewhere like London or San Francisco. Another drawback is the difficulty in finding experienced staff in Ireland. The Irish educational sector has been inexplicably slow in identifying the need for UX design graduates. Despite the fact that it’s been the main source of employment for designers over the last ten years, only recently have specialised UX courses began to appear. From an international perspective being located in Ireland does have some advantages. It makes us geographically neutral – we are not seen as being aligned with any one major market. This gives us cultural independence that is valuable when conducting global projects that often swing between traditional power bases such as Germany, the UK and the USA. We also have a growing reputation as a global technology hub, with Google, Facebook, Twitter etc, all having major operations here. While these guys conduct little or no design in Ireland, their presence bolsters our reputation overseas and makes our own UX design story from Dublin more credible to an international audience. 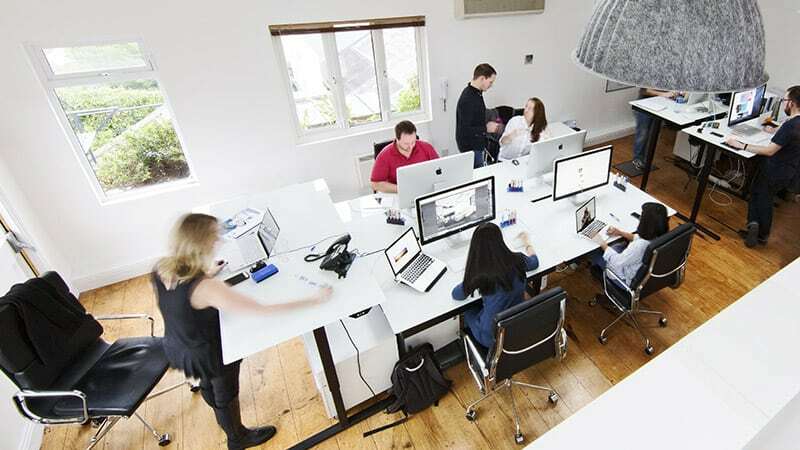 Frontend.com team working in their Dublin studio in 2016. Growing up, I always had a love of drawing. I have a clear memory from childhood, of being up in Dublin on a day trip with my older sister, as we walked through the city, she pointed out NCAD and told me that’s where people who are good at drawing go to college. That’s when I first realised you could have a job where you drew things. There and then I decided that’s what I wanted to do. Ultimately I applied to NCAD where I studied Industrial Design. Art college was everything I hoped it would be, as well as having a fantastic time, the Industrial Design department also managed to teach me a thing or two, providing me with the tools that I still use to this day. I can honestly say that after 22 years I still love being a designer – even though I haven’t picked up a pencil in a long time. That is a really difficult question to answer – I don’t really have any established design heroes. I think the people you work with in your early career have the most influence. In my case, my first real design job was in LG Electronics’ European design centre. I learned so much in the four years I spent there. It was an amazing place and even though I was young and inexperienced, I was thrown in at the deep end managing projects, negotiating production details with Korean engineering teams and dealing with marketing teams from all over Europe and Asia. Looking back, it was amazing that as a 25-year old I was trusted with so much responsibility. Matt Ryan was the studio lead and to this day I have never met a designer who could think about design problems at the same level of detail. He was also extraordinarily adept at understanding the subtle nuances of Korean business practice, which he schooled me in and which serves me to this day. Working alongside Matt was Malachy Spollen – where Matt was considered and shrewd, Mal was audacious and dynamic, he was also an inspirational team leader. Working with Mal taught me a lot about taking design risks and teamwork. When Mal left LG and ultimately set-up Frontend.com he brought me on-board, so he had a defining influence on where I am today. What would you say is the skill you have honed most over the years? Without a doubt it is business. I’ve heard it said that there are no design problems – just business problems for designers, and I’m inclined to agree. I can’t understand why business studies do not have a more central role in design education. It’s an essential aspect of design at all levels – from understanding the client problem (and how to solve it) to managing commercial contracts, invoices, etc. Everything I have learned over the last two decades has been done the hard way and that still continues to be the case. The vast majority of my time now is spent going through spreadsheets, contracts, and the like, but I still consider it all part of the design job. I once heard that the key to success is hard work and sincerity – so when you can fake those you have it made. Where do you see digital and physical product design moving to in the next ten years? A significant shift has taken place over the last number of years. With more and more technology embedded in everyday products, the boundaries between physical product and interface design have become blurred. This pattern will continue over the next ten years, meaning that the role of traditional product design will need to evolve to encompass UX. Product design teams of the future will be focusing more on interactivity and interface than on form factors and manufacturing. Products will become more fluid and extensible with easily downloadable enhancements and updates. The age of machine learning is also upon us and while I don’t expect to have a personal robot in the next ten years there will be a move towards greater personalisation in the way we interact with products – based on the way we use them. Ultimately this has the potential to create product interfaces that will reflect our own characteristics and thereby making the product-user relationship stronger and more meaningful. Product design teams of the future will be focusing more on interactivity and interface than on form factors and manufacturing. From an industry perspective, there are a number of interesting developments, but one that is close to my own heart is healthcare. From a UX perspective, we are about to witness an explosion of tech-innovation in the healthcare space. For years this area has been neglected, but a number of technology advancements are now in place facilitating some seismic changes. In particular, the Internet of Things and wearable tech are gathering more patient information than ever before, providing greater insights to healthcare teams. Smart drug delivery systems are already being developed to be context-aware and connected to the healthcare team. Big Data analytics will ultimately deliver insights into how disease management can be improved and ultimately we will be able to predict adverse events before they happen. The fact that Apple, Google, and Samsung are all investing billions in healthcare technology indicates that this is going to be the headline act over the next ten years and beyond. Iterations magazine provides a platform for designers and design researchers in Ireland and internationally to document, reflect and present their practices, theories, processes and artefacts.